Willie "Puddin' Head" Jones was a third baseman with the Phillies from 1947-1959. Jones was a big country boy from South Carolina who combined slick defense with a strong bat. The nickname Puddin' Head came from his childhood friends after a character in a film by the same name. Jones spent more than a decade manning the hot corner and played more games at third base for the Phillies than anyone except Mike Schmidt. At the plate, Jones' strong bat provided a boost on offense for the Phillies lineup. In 1949, Jones took over full time duties at third base for the Phils and early that season, Jones hit four consecutive doubles in one game against the Braves. That same season, in a game against the Reds, he hit a triple and a homer in the same inning. When the Phillies won the National League pennant in 1950, Jones' 25 homeruns and 88 RBI were both second best on the team. He led the league in games played that year also. Jones was an all star in both the 1950 and 1951 seasons. In 1956, Willie Jones had an 18 game hitting streak and in 1958, he drove in 8 runs in one game against the Cardinals, with two homers and a triple in that game. It was 1 of 12 times Jones would smash two homeruns in the same game. Defensively, his quickness and strong throwing arm routinely had Jones leading National League third basemen in putouts and double plays. Despite having health issues relating to his feet for many years, Jones' defensive skills had him ranked as one of the best third basemen of his era. 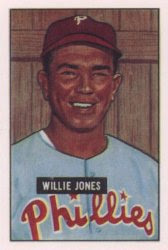 In 1959, Willie Jones was traded by the Phillies to Cleveland for Jim Bolger and cash in June, then in July he was dealt to Cincinnati where he would finish out his playing career in 1961. Willie Jones was inducted into the Phillies Wall of Fame in 1995.